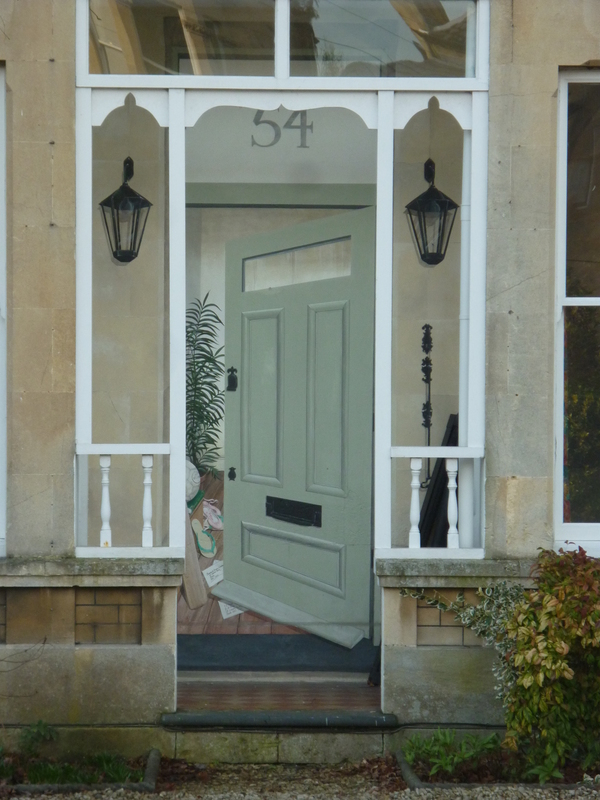 I do like a good trompe l’oeil, from the French (obviously) meaning “deceive the eye”. These are paintings on buildings in a lifelike style to create an impression of something that is not actually there. They are very popular in France,I’ve seen them on visits to Paris and when I used to make business trips to Lyon I found several. Last summer in Montpellier I found a house opposite the church of St Roch where the whole end of the building was painted showing steps, door and windows with people as well – all very realistic but not actually there. And now we have found one in Bath; Mrs Sixwheeler spotted it from the bus and it’s only about a quarter of a mile from home, so I felt duty bound to go and take a picture. Now, along with ‘ghost images’, I will have to be on the lookout for more. In case it’s not clear the open door is painted, the real wooden arch leads onto a porch with the actual doors to two semi-detached houses to the left and right.